Before I start a quick hello to a new reader Joppy, who is soon to retire in January 2012. I hope you'll be making some wooden warriors of your own during retirement, and willing to discuss them here. Welcome. Today's entry is a guest blog entry of a sort. It was actually a post on the Wargaming on a Budget forum on Yahoo and reader and internet buddy Jim Walton thought it was so good that he thought it should be preserved. So here are the collection of posts from Otto, a.k.a. nemopholist. Use tube oils like I do. They are much better to work with, much better coverage, more durable, and for what you get-- very cheap. True, some of the more oddball shades can cost $15 a tube, but you'll have it forever. I don't think I've gone through one tube (except black and withe) in the 30 years and thousands of minis I've painted. Takes a week or two to dry though. However, I have 7years War troops I painted 35 years ago and they are as vibrant and bright as they were when new, and much less chipped or worn. Now, I actually have a little experience with oils, and it wasn't good, mostly because I cannot tolerate the smells of the various oils and chemicals that go along with it. It also did not help that at the time I lived in Florida (USA), which is a high humidity environment, which is not very conducive to fast drying times with oils! They dont have a tenth of the durability of oils, and they react with the lead and oils of the paint and your hands to get shabby and drab. Oils will also form a moderately good barrier against oxidation, which acrylics will not. Do you have a measured way of thinning them before use and what do you use, turpentine? I say "measured" meaning that you can pretty much depend on a particular amount working for most colors, or do you do it "by eye"? Can you store them once you've mixed them? Yes to all. Now having said that let me talk out of the other side of my mouth. Grumbacher oils (though you can use any company, they are pretty much the same) can be thinned with a variety of media- paint thinner, mineral spirits (not always the same thing) or linseed oil. Each chemical does certain things to the paint and can achieve a certain effect. Linseed oil for example radically exponentiates the drying time but it provides the hardest and most durable product I've ever seen. It sets almost, (in my experience) to a hard glass-like finish. Turpentine will be easier to work with and allow faster drying and it will also "matte down" the surface. Mineral spirits and paint thinner the same, but be careful, some paint thinners are really paint cleaner and pretty much wreck the paint. I have pre-mixed and pre-measured oil paints and they store quite well provided you have small plastic vials to do so. Make sure they are air-tight. You can store them mixed with any of the media above though you may have to stir them up after long use as the thinning agents tend to pool at the top. I use a general color wheel to get the shade, tint, and tone I want and then mix as I go along. If I am running out, I simply squirt a little more on the paper and mix more till I get the same homogenous tone. The key is a good eye in estimating how much paint you will need to cover a batch of figures. When I first started out, being used to bottled paints, I mixed huge batches. Now I tend to radically under-mix. When I'm finished with a painting session I leave the slip of newspaper with the last color on it as a sample in a small box for future matching. The MOST essential part of this whole thing I have found is not the paint, not the brushes, not the thinner, but the process. What I do is get the empty boxes of computer paper from work, that is boxes from whom the computer forms were offloaded to a printer and box discarded. What I do is take the box and lid home and put the BOTTOM of the box in the upside down lid, mark the box, and then cut away the excess above the line, leaving a tray which fits inside the lid. This forms a "drying box" which I can use to place one project, close the lid and go on to another project, doing the same and letting the boxes stack up. Thus I can have a dozen units going at once and simply rotate through them doing more when I get to it. Thus with about 8 boxes I can keep continuously working on something. Another way to store the paint papers with a worthwhile smidgen of paint on them is simple zip-lock sandwich bags with the lid of a small gift box or pill box overturned on top of the pile of paint. It's not for everyone, but I like the fact that since I mix my own colors I can vary the intensity from a brilliant vibrant color to a washed out pale. Well there you have it, preserved for all time. I hope you find it useful, as Jim did. This is the first time I have done it, and I really should have done it every time someone new joined the blog, but I would like to welcome the new readers Captain Richard's Miniature Civil War, Schrumpfkopf, and Danjou's Hand. I hope you enjoy the material. So, I told you in a previous blog entry that I was going to experiment more with craft foam sheet for those parts that need more flexibility, or that are just a bit too hard to produce in wood. In this first example, I want to reproduce the classic 'defending' pose, as shown in the figure below. One of my concerns about using foam sheet is that it will not be solid enough to withstand handling. Only time will tell, but my thoughts were to try to saturate the foam with various liquids to both give it more strength and to provide a better painting surface. Previous tests with standard white glue were not satisfactory as the water-based paint dissolved the glue to some degree. Using Gorilla Glue Super Glue was a thought, but it is expensive and the foam absorbs a lot of liquid. In this last test I used Liquitex Matte Medium and the thickness seemed to clog the pores and create a even surface. Although I would not say the foam is significantly stronger, it is more rigid. So here is the Prussian Napoleonic Landwehr private painted up. Although the top of the hat should be larger – a flat head plug of the appropriate size would be better than a 1/3 spool – I am not going to complain with the results. You can see how I used a lot of foam for this troglodyte archer (still needs his bow). Although the hands look misshapen and out of scale, you can easily cut it back once you fold the material, glue it in place, and see what needs to show and what can go. The easiest way to get a little consistency in you foam parts is to make a template. I created my in a computer drawing program, printed it to paper, used that paper to transfer to wood, then cut the wooden part out. You want a wood (or metal) template so that when you cut around it with scissors, you cannot damage the template itself. Here you can see my template for the bent arm. I usually cut a little excess at the flat end to make the hand, leaving more material if I need a longer hand to grip something. Once I've fashioned the wood piece I can simply press it hard into the foam sheet and cut out the indentation, as (barely) shown in the figure below right. The troglodyte arm and hand was fashioned in the same way, using an old wooden base for the template material. I hand-drew the arm and hand (should have used the computer) and whittled the foam down to a manageable size from there. For my spiky bits (troglodyte crests and spines) I found some craft scissors in the scrapbooking section of Michael's and found some that produced a nice jagged edge cut. Those make creating strips of spiky bits very easy! The good thing about craft foam sheet is that they come in a variety of thicknesses and colors. In the past I have purchased several structured tooth tungsten carbide cutters from Dremel (the taper and the cylinder) to rough carve wood, but I haven't been overawed with how much faster it can remove stock than a regular coarse sanding drum. 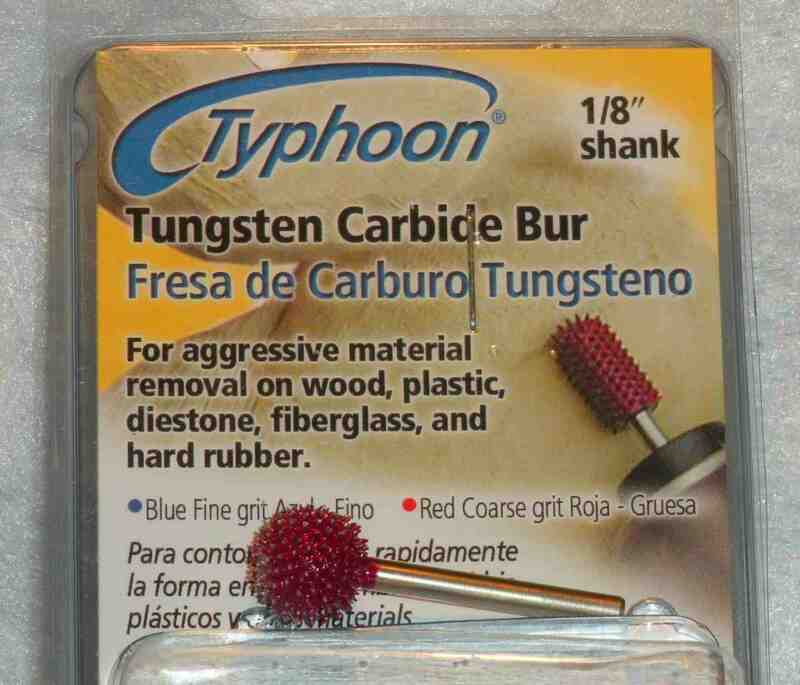 So it was with some hesitancy that I ordered a Typhoon Tungsten Carbide Burr (Coarse) from Micro-Mark. As the package says: for aggressive material removal. Now we are talking! It looks kind of funny and as you can see in the picture, it already has wood dust in it, because I had to try it out on my toughest problem: hollowing out the interior of a 1/2 spool in order to use it as a hat. As you can see from the pictures above and below, it made a nice little bowl that fit perfectly on my game piece figures' head. And it did it very quickly and easily. No bucking of the tool at all. The burr bit into the wood and tore through it with no problem. Highly recommended! I've gotten the coarse ball and cone shapes, now to get the rest. I also purchased some small chisels, so maybe I will do something with that soon and can have an article on that. I wanted to order a bending brake in order to make metal movement trays, so looks like I will be putting in another order to Micro-Mark soon, which is a really great place to get small tools for working with miniatures. One aspect that I am not satisfied with of the soldiers that I build is the stiffness of the arms. Part of that is the material I use (wood) and part of it is the source (a craft stick). If I used a wider craft stick, for example, I could cut a bent arm shape out and get more variation to the arm, but that makes each arm custom crafted, adding to the time to make a figure. Fine for one-off figures, but slower if trying to build a force. It was while looking at Kenneth Van Pelt's Zulu-era soldiers on his Penny Whistle blog, that I noticed and liked the bends and poses of his pipe cleaner arms, but in the end did not like the "fuzzy" look. I started looking about for other materials to make the arms with that would give me that flexibility, yet give me more of the flat, craft stick look. Essentially, what I needed was a flexible craft stick. I have used foam sheets for awhile now, mostly as simple outlines to define the areas of woods, hills, swamps, etc. so I am familiar with its properties, good and bad. On the positive side it is flexible and easy to cut and shape. It is about the same thickness as craft stick (a little thinner), but you can always buy thicker sheets, or even thinner sheets and glue them together. The downside is their porous surface, making it harder to glue securely and to paint. It would probably be necessary to seal the foam before painting. But that might be possible with a thick primer. I decided to experiment with a figure and try for a Napoleonic "high port arms" pose (which is more like the modern "present arms"). To start, I cut out the same basic shape and size that I used with craft sticks. I then glued the arms down using Elmer's Tacky Glue and waited for it to dry. I added a little Gorilla Glue Super Glue around the contact edges to add strength and also let that dry before moving on. The important thing was not to glue the arms too far forward, which I would have to do with wood. After the arms were on solidly I glued the flat toothpick musket directly on the figure. It looks a little funny at this stage, but it ends up about right. After the glue for the toothpick had dried, I put Tacky Glue on the underside of the right arm and pinned it to the body until the 'hand' reached the musket. With the left arm I only needed to glue the 'hand' directly to the musket. This was relatively easy to do, with the only tedious part being cutting out the arms to length. In the end it is probably no more work than cutting and shaping the craft sticks. With a little bit of twisting and turning, I think making a figure with more of a modern port arms pose would be fairly. Something like a defending pose would also be possible. So, look for more figures using this technique. I have already used foam sheet for the bent foot of a kneeling troglodyte (lizard man) and it looks pretty convincing. UPDATE: I painted the figure as it shows the shapes a little better.